In my newest post for Colour Lovers, I included my own patterns in addition to some excellent decal and wallpaper companies that give you a myriad of customizable options such as choosing the color of a wall decal, removable decals, custom wallpaper designs, and DIY murals. Please check out the post for lots of colorful finds for your walls from some fantastic international companies. Happy Monday, I hope you had a lovely weekend. My art in the new issue of Lovely Magazine. Plus some link love and unremarkable quirks. 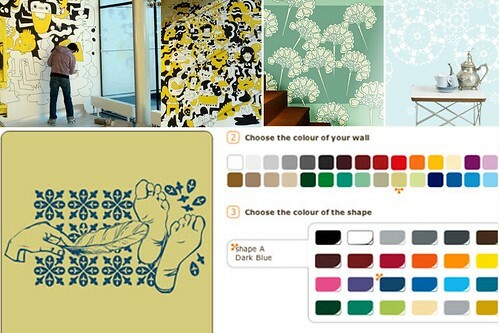 2 Responses to New Colour Lovers post: Wall Decals + Wallpaper: Adding color without paint. what a great idea! hope you had a nice weekend. Thanks Joanna! I know, there are just too many great ideas out there. I need a gigantic brownstone to live in so I can try them all out. I only have a few walls right now. I love that yellow bikini you posted, been thinking deeply about it. I also love that poster , I might get it. Will I be the last person on the planet to do so? Let’s go to a gallery soon….